Honestly, we were looking for another headline for this article. In the era of unicorn startups, it sounds a bit like another project of high expectations, undefined monetization model and postponed cash flow positive. But it is not. carVertical has delivered a very clear plan of activities after the completion of ICO in spring 2018. First of all, the service will be launched in 4 European countries. Another 9 will follow in 2019, along with API and white label solutions for business customers. 2020 will mark the debut of carWallet application in beta version and the largest expansion leap – 10 more European countries will be added. By the end of 2022, carVertical will also be present in Asia, Middle East and North America. The key indicator of scope for such a business is the ability to gain pace with data boarding. While 2018 is expected to be rather modest with approximately 1 billion vehicle history records boarded, 2019 will mark the breakthrough with 5 times larger digits. It will go up all the way to skyrocketing 42 billion in 2022. As an example, Carfax declares to have 17.5 billion records in their database. And that’s after 30 years of operation! So what makes carVertical be so optimistic? Well, you cannot deny the magic of their business model, which includes IoT. carVertical is about to introduce their own miner, which will generate a stream of real time information, that will be sent to carVertical’s data farm for processing. The owner of a miner will receive tokens as a reward. 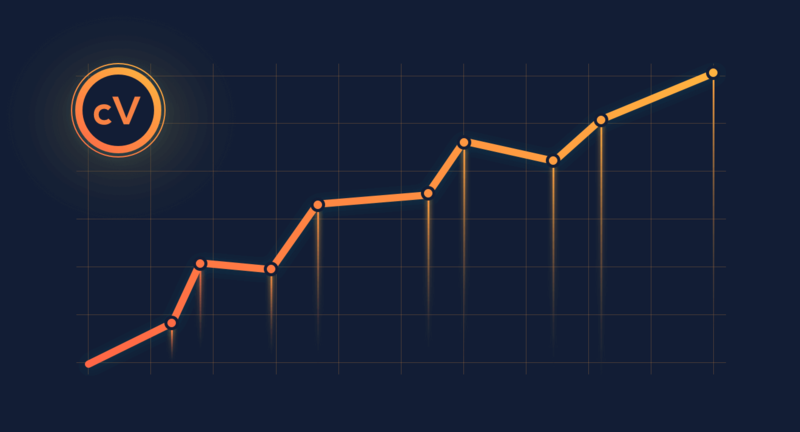 The initial pool of miners is expected to reach the level of 3 million by the end of 2019. It will go up to 10 million in 2020, while the benchmark for 2022 is almost 100 million. With its carWallet product, carVertical is also sharpening the teeth to grab a piece of a $200 billion value global auto insurance pie. The launch of carWallet mobile application is scheduled for 2020. The company is in advanced talks with PZU’s (one of the largest European insurance groups) Lithuanian branch. The topic of discussion is integration of insurance sales channels into carWallet application. As of 2022, carWallet alone will generate a sustainable cash flow of about €500,000. The report, recently co-authored by Morgan Stanley, favors carVertical‘s approach. It states that non-traditional players “to corner the auto insurance market“. New technologies, blockchain in particular, “will give these non-traditional players access to proprietary driver data, unmatched analytics capabilities, and direct access to customers“. The report expects 55% of today’s drivers to purchase insurance from a non-traditional player, with drivers under 34 years old more likely to do so. While trying to analyze the business potential of carVertical, we take a look back to 2013. In that year, IHS Inc. acquired privately held R.L. Polk & Co., the owner of used-car history provider Carfax, in a deal valued at $1.4 billion. Polk generated annual revenue of about $400 million at the time. Carfax was covering only North American market, with estimated car fleet size of 166 million units. Europe, the priority market for carVertical, is almost double in its size. If we draw an analogy to American numbers, this turns into potential turnover of $773 million and a company valuation of $2.7 billion. Let’s move on to Asia with the same principle. The car fleet totalled 292 million vehicles in 2013, meaning that the sales of a similar-profile company could be as high as $703 million, and such a company could be valued at the level of $2.5 billion. carVertical is striving to launch its services in Europe, Asia and North America within 5 years of run. That is an astonishing pace, given the fact that the company is targeting the used-car fleet of about 800 million vehicles. And in terms of numbers, this converts into $1.876 billion turnover and the market valuation of around $6.6 billion. Worth mentioning, that it is not the size of the market, but rather a realistic potential for a single healthy business.